Bobby is survived by his son, Jason (Rhyannon) Bowles, of Evansville, Ind. ; two daughters, Hazel (Martin) Schaeffer, of Boonville, Ind., and Charlotte Bowles, of Grayville; two brothers, Patrick (Elizabeth) Bowles, of Virginia and Jessie (Cherie) Bowles, of North Carolina; three sisters, Cathy Travelstead of Norris City, Susan (Robin) Checketts of Raleigh, and Paula (Gray) Schlesinger, of Mt. Carmel. He was preceded in death by his parents, Ray and Rosalie Bowles and a brother, Steven Bowles. Jr. Lady Cardinals 2nd at State! 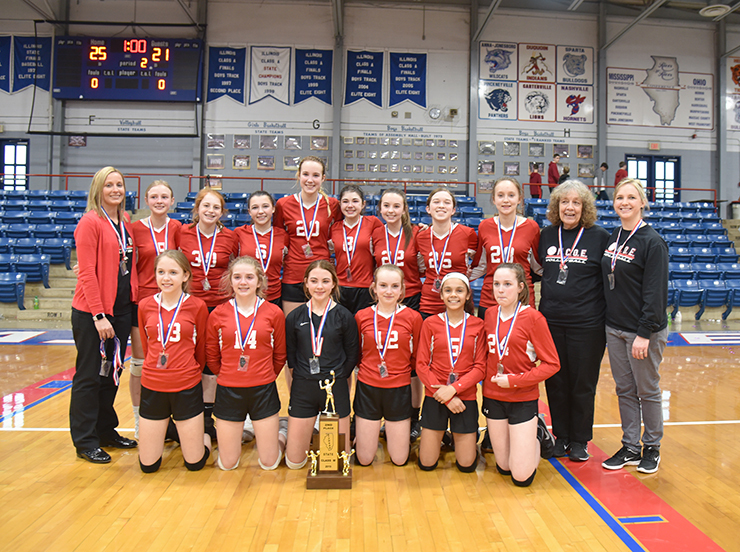 They may have been 2nd at the Class M State Tournament in Nashville, Ill., but they were first for NCOE, this team placing higher than any previous attempts by NCOE to become State Volleyball champs. The Jr. Lady Cardinal Varsity Volleyball team worked hard to make it to the final playoff match on Saturday, March 23, after beating Adams in the first match, and later besting Millstadt in the semi-finals. That left them facing the unstoppable Breese Bobcats for the finals. The Cardinals battled persistently, but ultimately lost to the Bobcats 25-21.